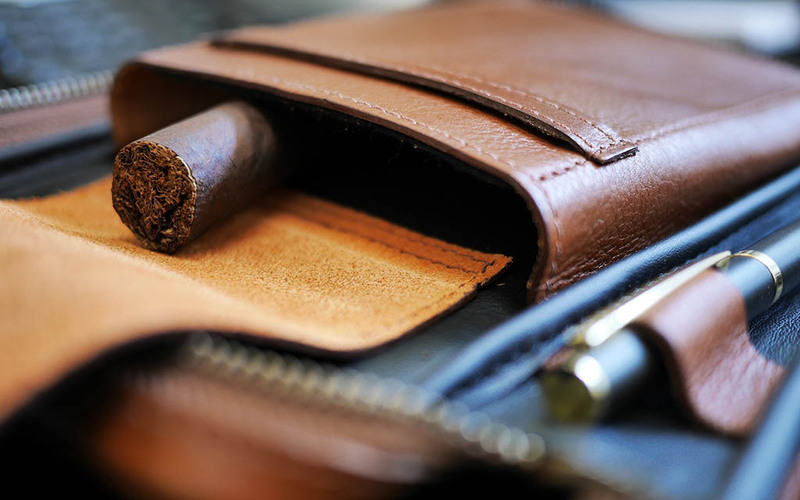 THIS LEATHER CIGAR TOTE IS A MURSE WE CAN GET BEHIND - Peter James Leather Co. Thanks to some good old-fashioned diplomacy, Cuban cigars are going to be widely available on U.S. soil very, very soon. You’re going to want some. You’re also going to want something to convey them in that isn’t your pocket. Which is where these new cigar cases from Canadian leathersmith Peter James come in. The cases, made “by aficionados for aficionados,” are crafted from veg-tan Italian leather, and each one is cut and assembled by hand in either cognac or black. The zippered tool kits come with a slip to store a pen or cigar poke, one pocket to hold a cutter or lighter, and a second felt-lined pocket that can store 4-5 large cigars. The case is durable enough to be carried in a briefcase or backpack but also small enough to be toted around by hand. Each one goes for $155 but add-ons like an S.T. Dupont lighter or Custom Ash Siesta cigar holder will run you a little extra. As for getting to Cuba ... take the jet.